The next morning we were scheduled to leave Beijing but we had a couple of stops to make first. Naturally since we were leaving it was a gorgeous, sunny day. It was a bit cooler than the days prior but still very pleasant in the sun. 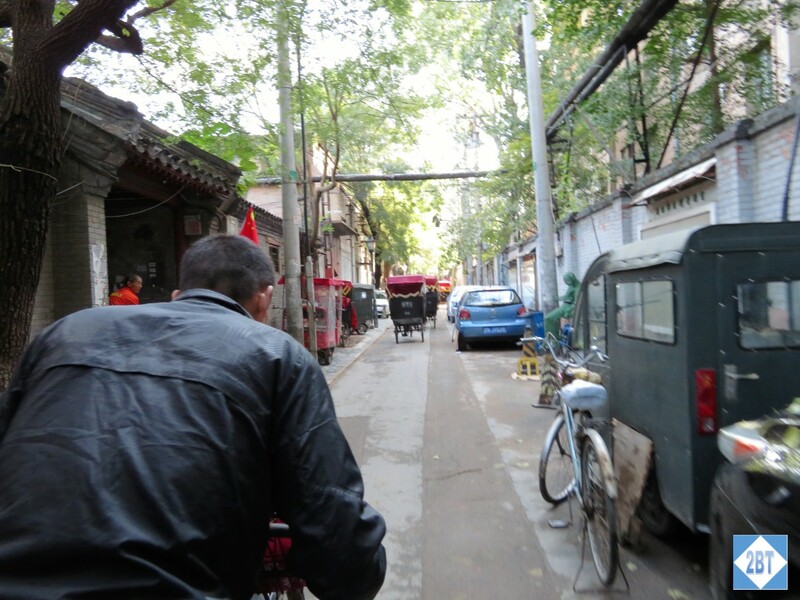 Our first tour was of the traditional hutong (hoo-tong) areas of Beijing via rickshaw. 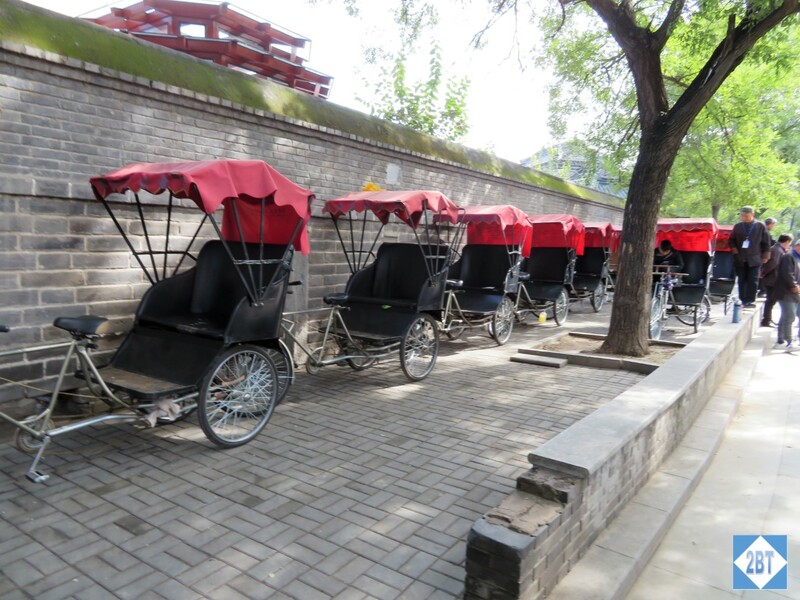 After being driven to our starting point, we paired up into bicycle-powered rickshaws (or pedicabs) for a tour of the older parts of the modern city. 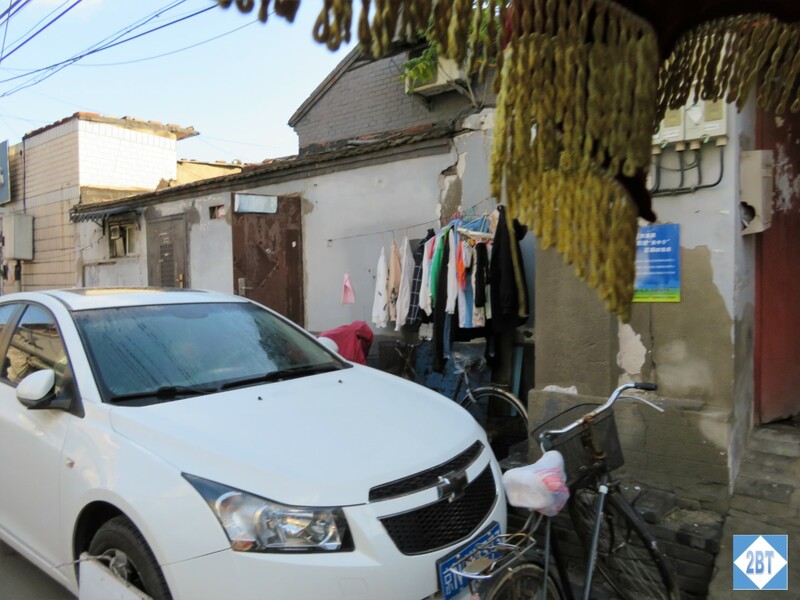 A hutong is a traditional neighborhood where several courtyard residences were joined together to form a group. These are generally one-story homes with narrow alleys to separate one home from another. 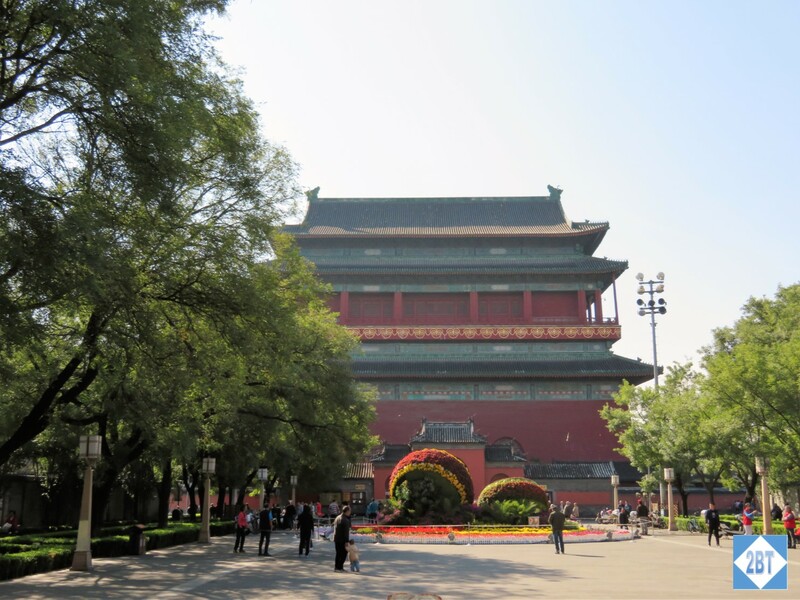 The first hutongs were established back in the Yuan dynasty in the 13th century. There may be communal bath houses for several homes. 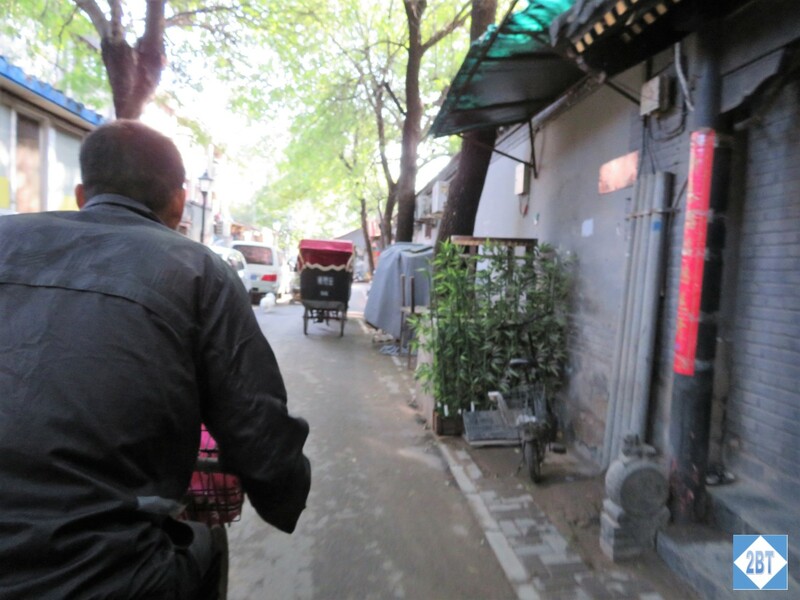 In the mid-20th century a number of the hutongs were demolished for new roads and buildings and since that time they’ve become an area that is now highly prized and protected as a symbol of the communal ways. Touring the area by pedicab you get a real behind-the-scenes view of everyday life. 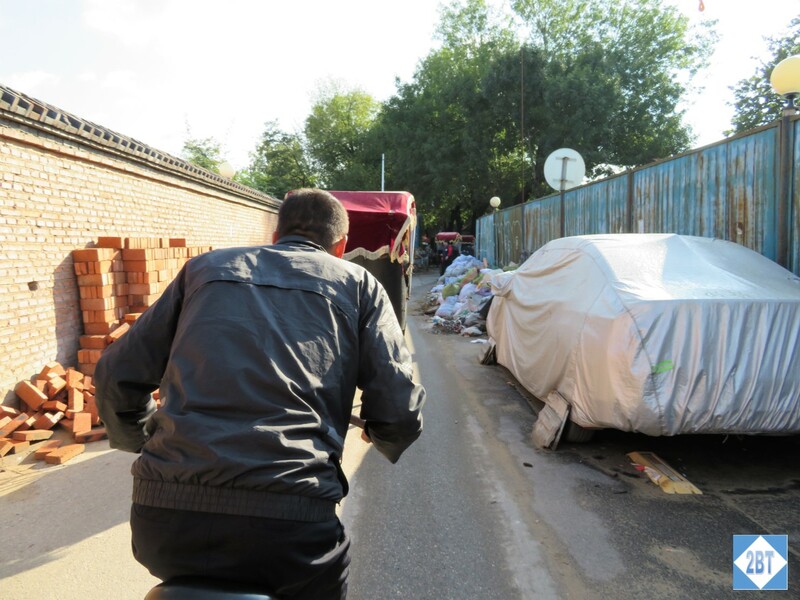 Though the buildings are different, you can still see people hanging their laundry out to dry, kids leaving their bikes out instead of putting them away, just like you see in people’s yards in other countries, including our own. Starting the pedicab tour. The wood over the wheels prevents damage from dogs peeing on them! Kids bikes left out? Check. Laundry on the line? Check. 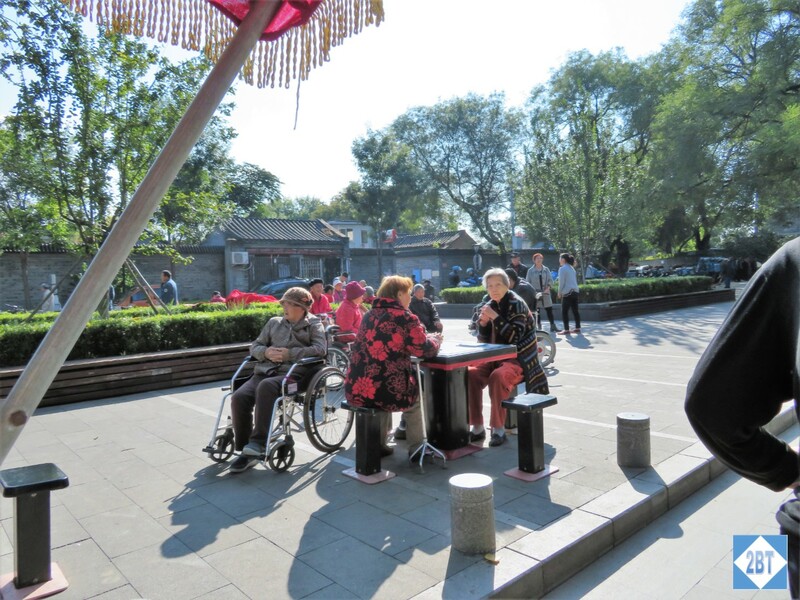 Our tour ended in a local park near a senior citizens’ home. 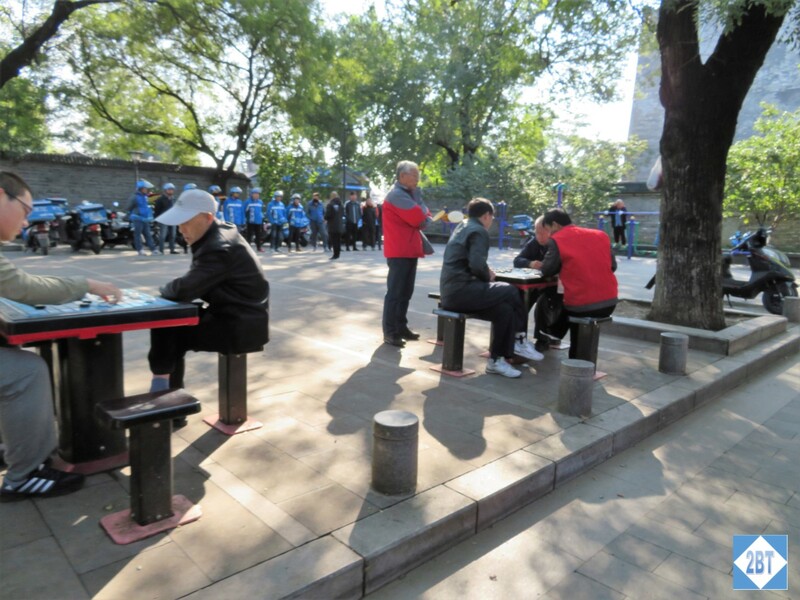 There we saw ladies sitting around a chess table talking and not playing chess while the men sat around theirs, playing chess but not talking. The park was near the Drum and Bell Towers. 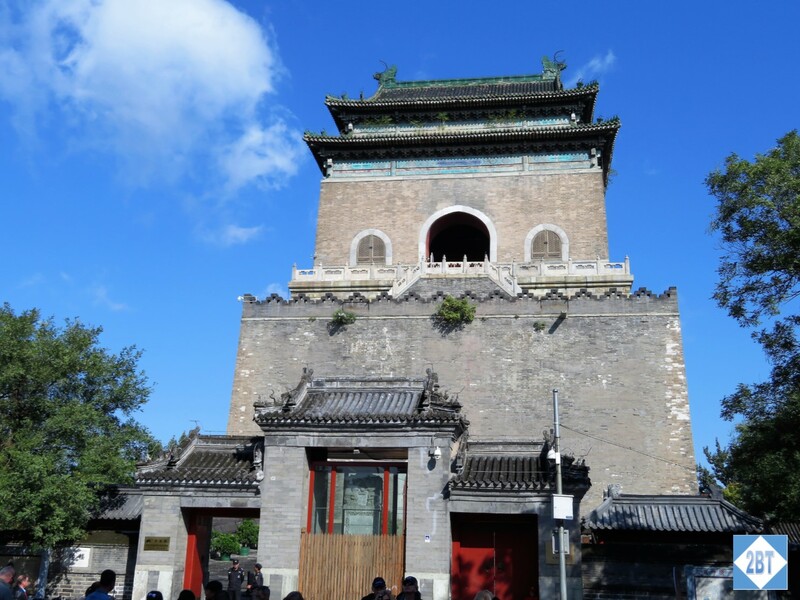 The original version of these towers dates to the 1270s during the reign of Kubla Khan. In 1420 they were reconstructed in a new location with significant renovations in the early 1800s. 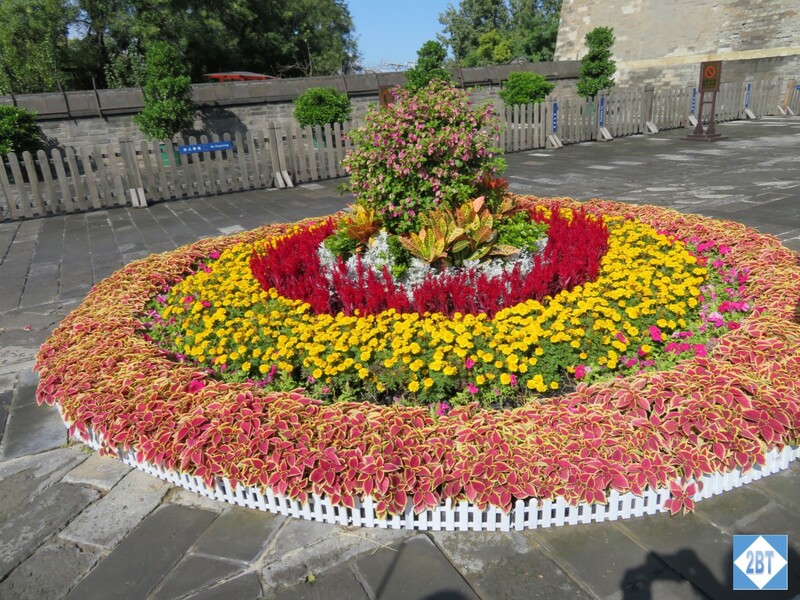 In the 1980s they were opened to tourists after a great deal of repair. 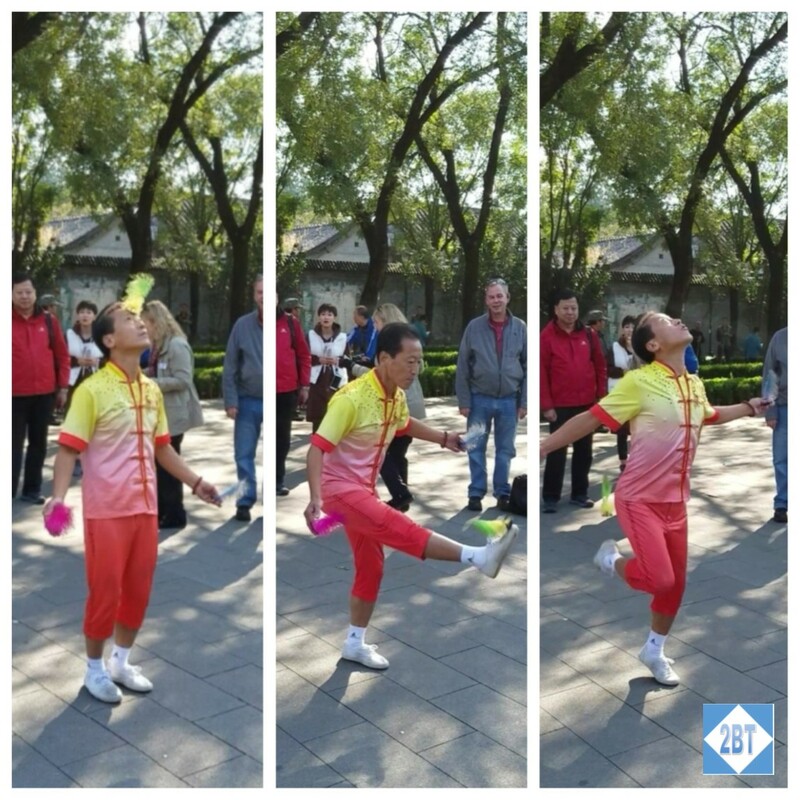 Between the two towers is a paved area and it was here we were treated to a show by this gentleman who was renowned for his ability with this small, feathered toy. Think of a badminton shuttlecock and it’s sort of the same idea: a weighted disk that lays flat and feathers attached to its center. He could kick the thing around like a hackey-sack, bounce it off his arms, legs, feet and forehead and generally keep it bouncing along. Of course when we tried to emulate him it was a complete disaster but we had fun with it. Front, back, on his head, it didn’t matter, he could keep that thing flying! Our next stop was the tea shop inside the Bell Tower. The young woman who conducted our tea tasting spoke fantastic English. 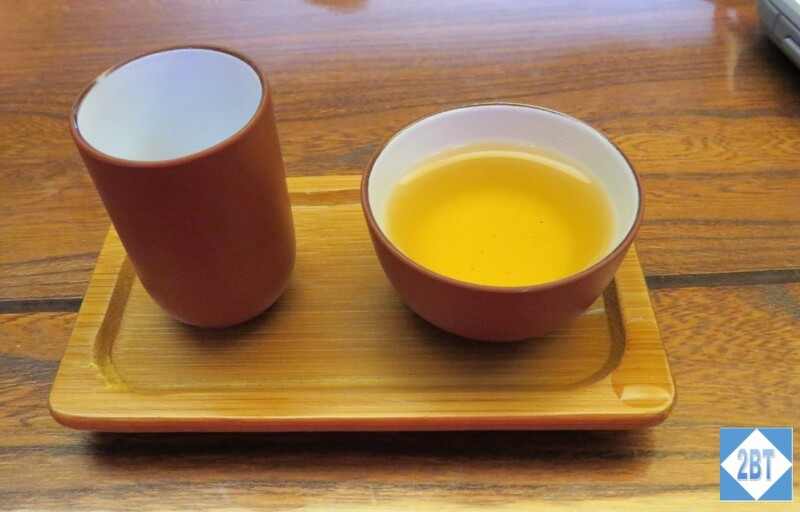 We were given two small dishes: the taller one would be filled with the tea and then we’d pour it into the small bowl for drinking. We tried five different teas though I only managed to capture four of them in photos. 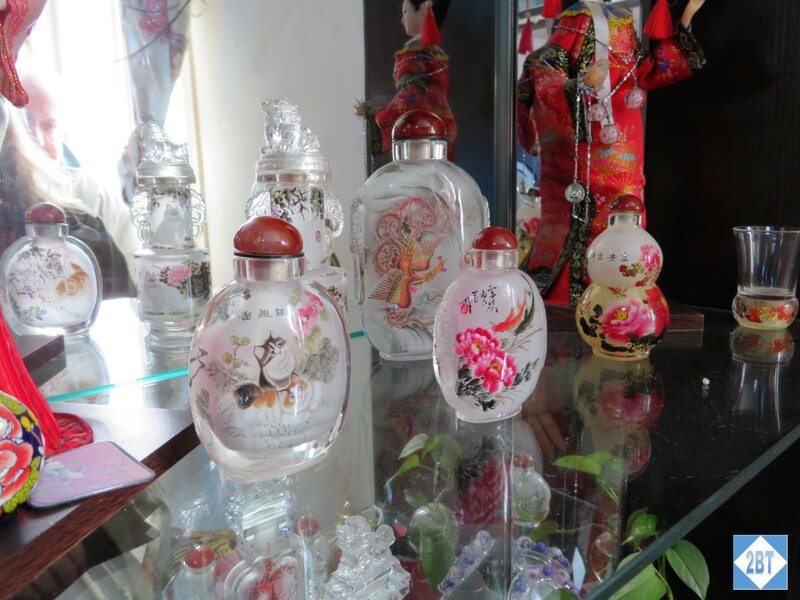 The first was jasmine green tea, which has a light yellow-green appearance, like we’d just had in the hutong and had been readily available at several places where we’d dined so far. 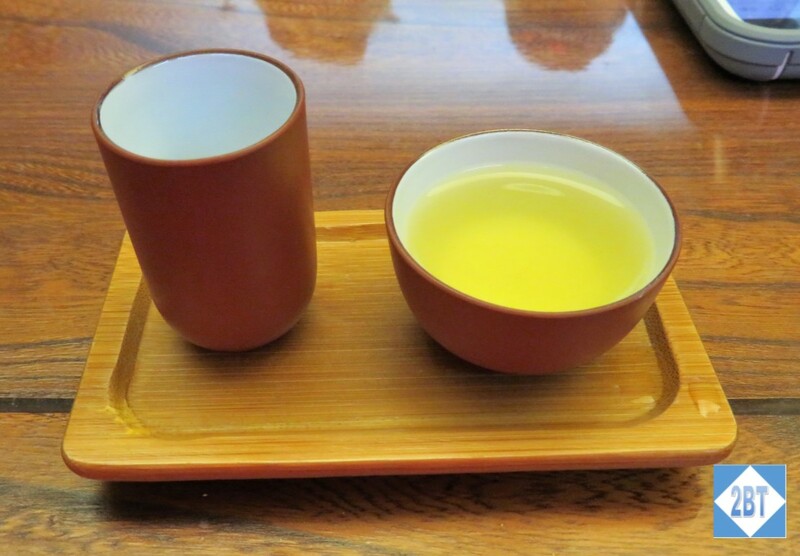 The second tea, more strongly yellow, was Emperor’s tea, which is Oolong with ginseng leaves. 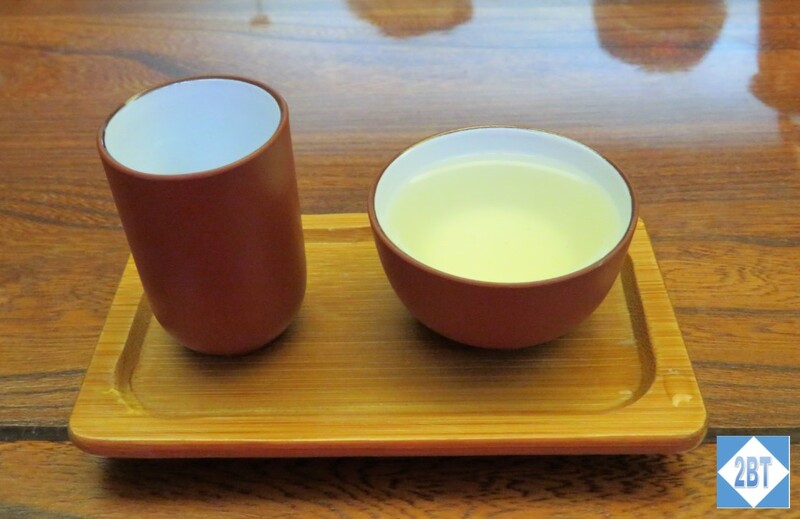 The third tea, that I failed to photograph, was a decaffeinated fermented tea which had herbal/medicinal uses. The fourth tea, more gold in color than the others, was a Lychee and Rose Hips tea. 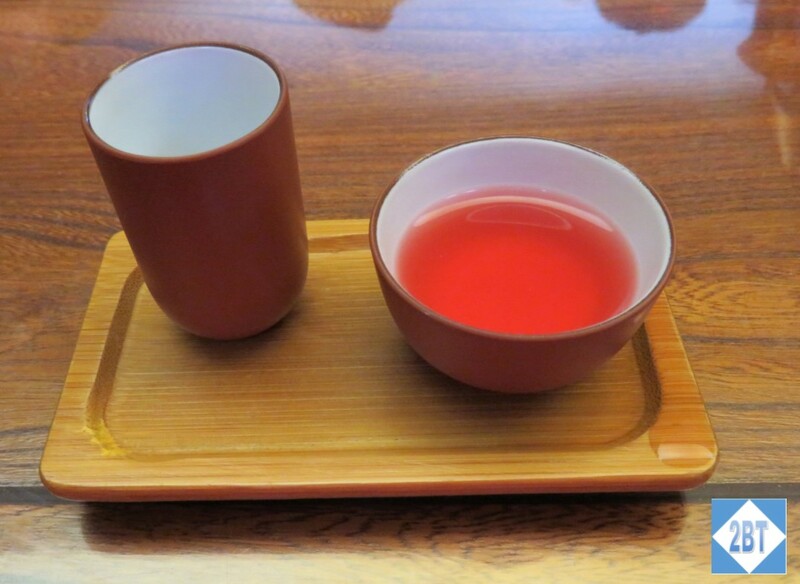 The last one was a dessert tea, one that’s good for summer, called Fruit and Flower tea and it was noticeably sweeter than the others. The red color was a big clue it would have a different taste. Once we were done with the tea it was time to head to the airport for our flight. This would be our first intra-China flight and I was curious to see what it would be like. Most of our flights, this one included, were on China Eastern, a SkyTeam partner of Delta. Our checked luggage had been collected from the hotel and it had already been checked in when we arrived. Our tour leader, Jack, obtained boarding passes for everyone. Since the counter was not busy at that time, several of us were able to get our Delta SkyMiles numbers added to the reservation, meaning that was one less flight we had to follow up on when we got home. The airport was fairly warm and I can only imagine it gets quite warm during the summer. There were a number of food vendors and most of us got a snack while we were waiting. Once we boarded our all-economy flight and got settled in, it was a fairly routine flight. They did have the flight map running on the overhead but no other IFE was available. In fact, no electronics are allowed to be turned on, even in airplane mode, except for laptops once cruising altitude is achieved. The flight attendants all looked very young and it seemed on all our China Eastern flights that the female making the PA announcements spoke very quietly, making it hard to hear over the usual airplane noises. Though the flight time was only about 1.5 hours we were still served a hot meal and it was not bad at all. Amazing how other countries can do this on such a short flight but the US can’t. Of course the US also doesn’t require FAs to quit at age 35 or ask permission to have children, etc. so there are trade-offs. I also liked that the seat belt for the middle seats was red while the aisle and window seats had blue belts. This made it very easy to discern which belt belonged to which seat. We arrived pretty much on time and our luggage was pulled from the belt for us. We had to identify it and then the luggage handlers took care of loading it on the bus for us. Hey, I kinda like this don’t-have-to-handle-my-luggage thing!